EPLAHomes Blog – Experience a new level of excellence in luxury real estate. Discover RE/MAX Estate Properties. Jane St. John will be honored at the Spring into Well-Being Celebration. Outside of AMCS, Jane St. John supports other community organizations including Helen’s Room, a non-profit organization that provides a confidence-boosting service for cancer patients. Jane herself is a breast cancer survivor. Other organizations where Jane gives her support are the Education Foundation and the LAX Coastal Chamber. She also helps organize multiple community events such as the Playa del Rey Toy Drive, the Rock Roll & Run, and Jet to Jetty. Her kindness and selflessness show how one person can change many lives. 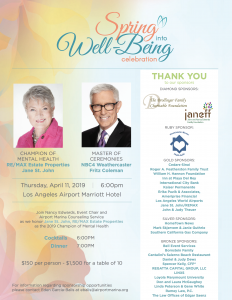 Jane will be honored April 11, 2019, at the Airport Marina Counseling Service Spring into Well-Being Celebration. Tickets are $150. Congratulations, Jane! RE/MAX Estate Properties is proud to congratulate Jennifer Riddle on receiving Manager of the Year from RE/MAX LLC! Presented each year, this award recognizes the network’s most respected leaders. Achievements and leadership are major elements in the RE/MAX culture, and individuals who excel in these areas have a deep, positive effect on their communities, colleagues, and networks. The RE/MAX Awards & Recognition Program provides a way to honor these contributors by shining a spotlight on quality and excellence. The awards celebrate accomplishments, fortify reputations, and inspire others to reach higher in their own aspirations. Jennifer joined RE/MAX as a receptionist in 2001, was promoted to Administrative Manager after her first year, and worked her way up to Director of Operations. She currently serves as a RE/MAX Ambassador for Children’s Hospital Los Angeles. Since embracing this role, Jennifer has helped RE/MAX achieve Diamond Status, the highest level of awards, from Children’s Hospital every year. The Manager of the Year Award is determined through a nomination process. Regions submit nominations in December, and the final selections are made at RE/MAX World Headquarters in January. She was selected as Manager of the Year out of 364 offices. Congratulations, Jennifer! RE/MAX Estate Properties is proud to welcome Melanie Archer as the company’s General Counsel. She is a valuable asset and we are thrilled to have Melanie lead our in-house legal team! Melanie has a deep knowledge of real estate and business law with a very practical approach. She assists our agents with one-on-one support, risk management, round table legal discussions, and agent education. 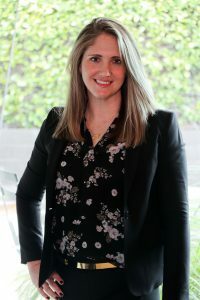 She provides insight into the ever-changing real estate industry, while ensuring our agents are expertly trained on all new laws and policy changes. Melanie practiced real estate and business litigation at Cox, Castle & Nicholson and later at Spierer, Woodward, Corbalis & Goldberg prior to joining RE/MAX Estate Properties. 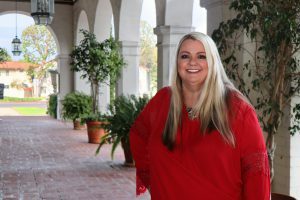 While there, among other things, she gained extensive experience in helping buyers, sellers, and their agents negotiate the difficulties that can sometimes arise when purchasing property. She previously worked with her husband at Archer Building Group, Inc. where she acquired extensive knowledge of the construction industry. She received her BA from USC and her JD from UCLA School of Law. She is also a real estate investor and owns/operates apartment buildings in Southern California. Melanie is a South Bay native with three adorable, young boys. She spends her weekends watching little league games and trying to find time for tennis and yoga (good luck!). With a dynamic intelligence, Melanie can speak to agents about anything from residential and commercial sales to raising three boys. She is poised and has a calm demeanor. 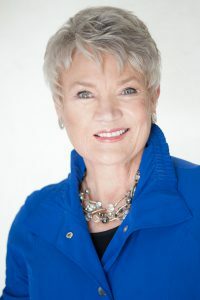 She’s helping RE/MAX Estate Properties soar to new heights by giving us a General Counsel with tremendous business comprehension and a willingness to amplify RE/MAX Estate Properties and our agents as a whole. We’re so happy to have her. We’ve got the real estate market data you need for moving in this marketu. The better you understand your local market, the savvier a real estate investor you will be. We’ve made it very easy for you to stay up to date with our monthly Market Intelligence Reports! Westside, South Bay, and Palos Verdes each have their own report and highlight the communities within. Please enjoy and continue to edify your real estate market knowledge! We’ve got a secret for you. The better you understand your local market, the savvier a real estate investor you will be. We’re stating the obvious, but it takes time and energy to do the research. Luckily, we’ve made it very easy for you to stay up to date with our monthly Market Intelligence Reports! Westside, South Bay, and Palos Verdes each have their own report and highlight the communities within. Please enjoy and continue to edify your real estate market knowledge! Give these Top Producers a round of applause! The Answer: Warm & Inviting Open Houses! These Open Houses are Mind Blowing!! Sandy feet, sun-kissed noses and the distant rustling of white water. There is something undoubtedly calming about walking down The Strand, the scenic walking and biking path which connects Manhattan and Hermosa Beach along beachfront real estate. The Manhattan Beach represents all that we love about Southern California living: simplicity, ease, and distinct style. The rumors are true, life slows down at the beach, which is why people are always vying for their own place to call home in the notable, luxurious and well-established Manhattan Beach Sand Section. During the Second Quarter of 2017, a total of 28 homes in Manhattan Beach Sand Section sold on the market. The average sold price was $4,078,800*. The highest sale closed at $21,000,000 and sits on The Strand itself. We’ve hand-selected two homes currently For Sale that you absolutely MUST see before they are gone. Both homes are located on the highly-coveted Bayview Drive, which sits merely steps away the ocean. *Based on information from CRMLS and/or CARETS as of July 3, 2017 and/or other sources. Display of MLS data is deemed reliable but is not guaranteed accurate by CRMLS and/or CARETS. The Broker/Agent providing the information contained herein may or may not have been the Listing and/or Selling Agent.